School acts are fundamental to the historiography of schooling. In the chapters comprising this book, several fundamental questions will be examined, including: Why were the school acts passed, and under what social and political circumstances? What was their content? What was their impact and significance? To achieve a comprehensive comparative and multidisciplinary analysis of school acts and the role they played in the rise of mass schooling, which is a novel contribution to the field under study, this book includes chapters dedicated to 13 national case studies focusing on the manner in which school acts were embedded in their respective cultural, social, political, and economic contexts. 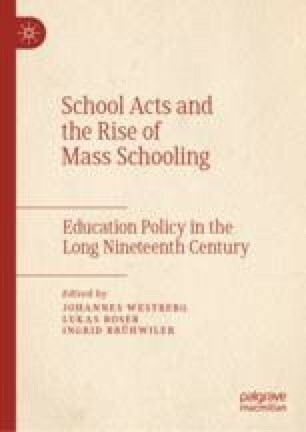 In addition to providing analyses of the content, organization, and funding of nineteenth-century schooling through the histories of school acts, this volume thus provides an international overview of school acts unique in scope and detail. First, we would like to thank the authors of this book. This volume would never have been compiled without your expertise, enthusiasm for the topic, and your willingness to spend considerable time and energy on writing, revising, and editing your texts. We also wish to thank Daniel Tröhler for his insightful comments, and his thorough yet always constructive criticism. For financing and hosting a workshop in October 2017, where we had the chance to discuss the book chapters for the first time, we thank the Sven och Dagmar Saléns Stiftelse, the Swedish Research Council, and the Department of Education at Uppsala University. This workshop marked a major step in the process of writing this book. It gave us the opportunity not only to discuss the structure and the content of each chapter, but also to learn more about some general problems and obstacles we had to overcome to produce a coherent and insightful volume. This discussion was continued during a double session at the ESSHC 2018 in Belfast, where additional steps toward the publication of this book were taken. The process of finalizing the manuscript was supported by subsidies from the University of Applied Sciences and Arts, Northwestern Switzerland, and funds from Örebro University, Sweden. We would like to thank those institutions for their support. Finally, we wish to thank our editors at Palgrave Macmillan, Eleanor Christie and Rebecca Wyde. Working with them has been a wonderful experience. From the beginning to the end of this project, we benefitted tremendously from their support.